Industrial 2 of 5 is very similar to the barcode Interleaved 2 of 5. The nominal print ratio (ratio between the thickness of the wide bar and that of the narrow bar) is 3: 1, but may vary from 2: 1 to 3: 1. 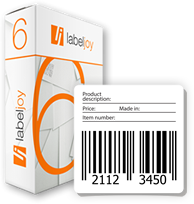 LLabeljoy requires you to enter up to 255 characters to create the barcode. Only texts containing digits will be considered.